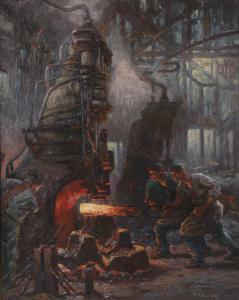 German Expressionist painting of factory workers by Anton "Toni" Wolter (1879-1929) ($1,060). 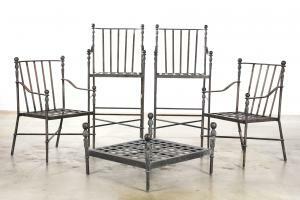 Large suite of Michael Taylor "Montecito" garden furniture ($4,500). Art Deco style patinated metal ceiling fixture in the manner of Edgar Brandt ($1,060). The auction, held on October 21st, drew a diverse and enthusiastic crowd in the room and online achieving a sell through rate of 95 percent. LOS ANGELES, CALIF., UNITED STATES, October 23, 2018 /EINPresswire.com/ -- Los Angeles - Continuing the success of its inaugural auction at Andrew Jones Auctions, the sustainable living and budget friendly DTLA Collections and Estates auction held on October 21 drew a diverse and enthusiastic crowd in the room and online achieving a sell through rate of 95%. The beautifully appointed gallery just a few blocks northeast of USC in downtown greeted clients like VIP’s as they enjoyed coffee, muffins and a complimentary lunch while shopping the varied offerings to suit every taste and pocket. There were some deals and steals to be had, but the sale also achieved impressive prices. A German Expressionist painting of factory workers by Anton “Toni” Wolter, 1879-1929 sold for $1,060 and an Italian School painting of a Venice canal at night realized $2,250. A large suite of Michael Taylor “Montecito” garden furniture more than tripled its pre-auction estimate and sold for $4,500. 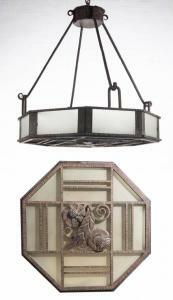 An Art Deco style patinated metal ceiling fixture in the manner of Edgar Brandt realized $1,060. An Art Nouveau pictorial marquetry tray by Emile Gallé achieved $800. without reserve. Among the highlights of the auction include an original pencil drawing of a cat by Léonard Tsuguharu Foujita (est. $2,000-4,000), an oil on panel painting of a Swiss valley by Albert Bierstadt (est. $6,000-8,000) as well as modern design, fine jewelry and watches, antiques, decor and accessories. The week-long preview begins on November 10.